R E G I S T E R B E L O W ! New Netherland & Old England is a weekend-long event being hosted by Locust Lawn, a Federal-era historic manor on a farm situated in New Paltz, NY. This event builds off the success of the 1705 Encampment held in February of 2018 and seeks to expand upon the great work done there. The event will highlight the life and times of the Atlantic World from the Restoration to the War of Spanish Succession (1660-1714). This span of 54 years was a transformative one which shifted the balance of global power from the continental forces of Europe towards the budding British Empire of the Atlantic. The Dutch had settled the area of New York and New Jersey following Henry Hudson's exploratory voyage and experienced significant growth in the 17th Century. Wars between the English and Dutch resulted in the capitulation of New Amsterdam to the English in 1664, thereafter known as New York City, but Dutch culture, language, and identity would continue to influence the lives of those who lived there. After the English King James II was overthrown in the Glorious Revolution of 1688, replaced by his son-in-law, the Protestant champion Willem, Prince of Orange, thereafter known as King William III, the English and Dutch found common purpose against King Louis XIV of France. Louis's desire for personal glory and his calculated ambition led him to clash against King William's coalition in the Nine Years War (known in America as "King William's War") from 1688-1697 and yet again in the titanic War of Spanish Succession (known in America as "Queen Anne's War") which lasted from 1701-1714. The result of these great conflicts was clear. France had asserted itself as the dominant European power and permanently reduced the power of the Dutch and Austrians. While the Dutch acquitted themselves well in action, the "golden age" of the United Provinces had unquestionably passed. At sea, Great Britain became the dominant maritime power and was quickly establishing itself as the foremost colonial power in North America. This event is open to reenactors portraying French, British, Dutch, Spanish, and other powers of the period between 1660-1714. Authenticity is our priority. ONLY those impressions which fall into the span of 1660-1714 are allowed. Pirate impressions are not permitted without prior approval. Please make every effort to see that your displays and presentations are of the top level in terms of quality. New Netherland & Old England is intentionally broad. Our goal is to unite Stuart/Bourbon baroque reenactors. It will give us numbers and allow us to explore the interconnected nature of the era as Europe entered the 18th Century with a newly shaping concept of empire, while the colonies began to develop and the seeds of their own identity were planted. During the course of the day there will be cooking and craft demonstrations, life in the late 17th/early 18th Centuries, and we will be based out of the Stone House. Since this is being held in Winter Quarters (March) please be sure to dress appropriately for the occasion. Cooking cannot be done inside the house but it can be done outside. Dawn says you will not go hungry! Please be sure to bring your own dining kit, however. 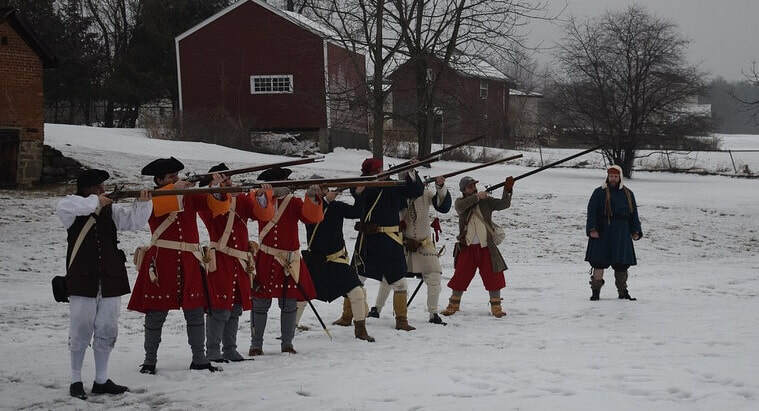 Reenactors are welcome to stay overnight indoors if they so wish. Participating units must submit proof of insurance to complete their registration. Those without insurance will be asked to sign a waiver and release.